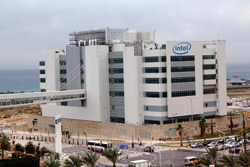 (Haifa, Israel) – Computer hardware giant, Intel Corporation, has received LEED® Gold certification, the internationally recognized stamp of approval from the U.S. Green Building Council, for its latest design/data center – IDC 9 – that opened in Haifa, Israel on June 15th. The all-new facility boasts the most advanced engineering infrastructure and is Intel’s first LEED-certified green facility, as well as the first building in Israel to receive LEED Gold certification. Additionally, the 259,000 square foot facility is noted for housing a 6500 square foot high performance data center. The energy needed to power and cool today’s high-tech design/data centers has radically increased in recent years. Factor in the reality of rapidly rising energy costs, and it’s easy to understand the heavy impact these types of facilities can have on an organization’s operational costs. With this in mind, Intel saw the design and construction of their new IDC 9 facility as not only an excellent opportunity to progress their “next generation” initiative of corporate citizenship and sustainability, but also as a potential target for significant costs savings. Thus, the mission defined the scope for a LEED-certified facility. Certification became possible by leveraging an integrated design approach and mobilizing a “Green Building” team in the early stages of the building’s design. A very important player on that green team was Tempmaster Israel® , a local energy management firm and a KMC Controls® authorized representative. Understanding that a high-efficiency HVAC and building automation system would play the largest role towards, not only energy conservation, but also indoor air quality and occupant comfort, the team came to rely heavily on Tempmaster. “Their expertise, knowledge, and professional presence were exceptional. Our systems at IDC 9 are highly complex and Tempmaster succeeded in keeping things simple. We are fully operational with a very reliable system,” commented Tzach Namer, the Mechanical/Electrical Project Manager at Intel. Utilizing KMC’s BACnet® Direct Digital Controls (DDC), Tempmaster integrated with the Schneider Electric® programmable logic controllers (PLC’s) and GE® SCADA systems to give Intel engineers precise control over their air handling systems. KMC's STE-6011 room temperature sensors installed throughout the employee offices and cubicles are connected to the inputs of approximately 400 KMC BAC-7003 BACnet Advanced Application Controllers (AAC) mounted on the VAV terminal units serving those spaces. Their “present values” are used as the “controlled variable references” for the PID loop to manage space temperature. In turn, 12 KMC BAC-7301 BACnet (AAC's) create a "hard-wire" data interface between the MS/TP net and the PLC in control of the local air handling unit’s fan speed drive and chilled water valve to minimize fan power and unnecessary cooling energy. The BAC-7301s are connected to five KMC BACnet routers working through a pair of BACnet OPC servers which form the BACnet IP network. Systems management is made possible through the use of KMC’s BACstageä operator workstation running at a remote server location. IDC 9 also measures carbon dioxide levels for improved air quality, captures and recycles condensate water from the AC system and uses it for irrigation, and heats itself using dissipated heat from ACs and data center computers. After completion, Charles Marcus, owner of Tempmaster Israel commented, “When we went into the project, Intel had trepidations over problems that could arise from the tight integration required between the BACnet controls, OPC servers, GE Cimplicity SCADA and their own in-house, individual employee, control application. The confidence we had in KMC's product won us the go-ahead. Additionally, KMC’s BACStage operator workstation and their BACnet routers were of great help in getting all of the controllers up and running on schedule," he added. Although there are a number of other noteworthy elements of sustainability that contributed to the facility's LEED Gold certification (such as rooftop gardens, processor-based data center, chimney racks, and day lighting), the advanced HVAC and building automation systems will have the greatest impact on ROI potential. The sustainable design of IDC 9 results in a net 17 percent reduction in total building energy use, with projected annual savings of 750,000 NIS (about $200,000 USD). Because of Tempmaster, KMC, and the rest of the green team, IDC 9 is hailed as one of the greenest design centers in the world and has set a new standard for Intel R&D buildings.